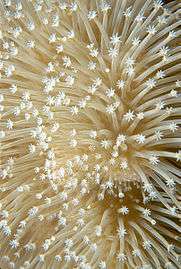 The Alcyonacea, or soft corals, are an order of corals which do not produce calcium carbonate skeletons. 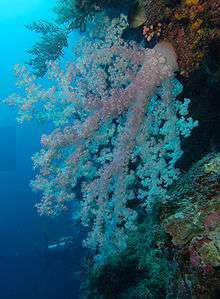 Soft corals contain minute, spiny skeletal elements called sclerites, useful in species identification. Sclerites give these corals some degree of support and give their flesh a spiky, grainy texture that deters predators. In the past soft corals were thought to be unable to lay new foundations for future corals, but recent findings suggest that colonies of the leather-coral genus Sinularia are able to cement sclerites and consolidate them at their base into alcyonarian spiculite, thus making them reef builders. Unlike stony corals, most soft corals thrive in nutrient-rich waters with less intense light. Almost all utilize symbiotic photosynthesizing zooxanthella as a major energy source. However, most will readily eat any free floating food, such as zooplankton, out of the water column. They are integral members of the reef ecosystem and provide habitat for fish, snails, algae and a diversity of other marine species. Many soft corals are easily collected in the wild for the reef aquarium hobby, as small cuttings are less prone to infection or damage during shipping than stony corals. Nevertheless, home-grown specimens tend to be more adaptable to aquarium life and help conserve wild reefs. Soft corals grow quickly in captivity and are easily divided into new individuals, and so those grown via aquaculture are often hardier and less expensive than imported corals from the wild. The most common examples of this are various species of Actinodiscus, especially common red mushroom coral. Wikimedia Commons has media related to Alcyonaria. 1 2 van Ofwegen, L. (2011). "Alcyonacea Lamouroux, 1812". World Register of Marine Species. Retrieved 2011-12-15. ↑ Kenji Konishi, "Alcyonarian spiculite: the limestone of soft corals", 1981; M.-S. Jeng, H.-D. Huang, C.-F. Dai, Y.-C. Hsiao and Y. Benayahu. (15 May 2011), "Sclerite calcification and reef-building in the fleshy octocoral genus Sinularia (Octocorallia: Alcyonacea)", Earth and Environmental Science, Coral Reefs doi:10.1007/s00338-011-0765-z.